Gelavish Gel Polish is a true LED and UV cured gel polish system, which utilizes both patented and patent pending technology. Our system boasts a thin self levelling low odour polish that cures in seconds with excellent adhesion. The mirror like high gloss finish won’t chip or peel, works equally well on both natural nails as well as artificial enhancements. 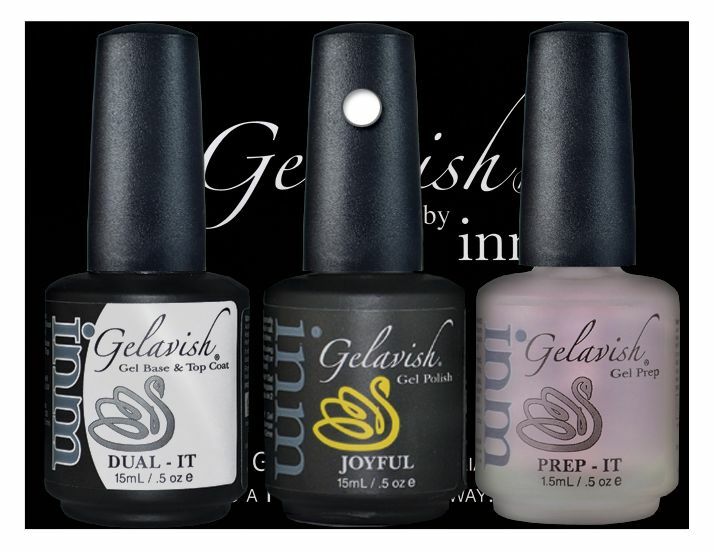 The gelavish nail will not lose its rich, high gloss deep finish, and when you are ready, removes in minutes. Adorn your finger and toenails with our rich, vivid colours and experience true 14 day durability with our easy to use gel polish system. Gelavish Moods Kit comes with a Prep-it, Dual It, Gelavish Colour, File-it, Etch-it and Technician Booklet. Wash and sanitize both Nail Tech’s and Clients hands. Using INM Pro Pusher, gently push back cuticle using “File-it 100/180gt file, shape the free edge of each nail. *Note: it is recommended that “All” gel polish be remixed before every use by turning the bottle upside down and rolling between your hands for 30 seconds. This is because particles and solvents in the gel tend to mingle instead of fuse. It is the nature of the gel polish to separate. Some colour faster than others. If gel polish is not properly mixed, then the gel polish will not settle on the nail and will peel. Step 1) Using “Etch-it (100gt Buffer) gently etch each nail (rough the nail, removing the shine) and remove the dust from the nail plate. Step 2) Apply Prep-it (prep) to each nail, allowing to dry completely. Optional: Apply Prime-it (primer) to each nail allowing 20 seconds to dry. We suggest the use of Prime-it if, 1) client is predisposed to lifting or 2) maximum adhesion & wear time are desired. Because adhesion will be increased, extra soaking may be required for removal. Step 3) Apply a thin layer of Dual-it, (Base & Top Gel) making sure to seal the edges of the natural nail. Cure for 30 seconds in a Gelavish “cure” LED Lamp or 1 minute in any 4 x 9 watt UV Lamp. Step 4) Apply a thin layer of Gelavish (Gel Polish) making sure to seal the edges of the natural nail. Cure for 30 seconds in a Gelavish “cure” LED Lamp or 1 minute in any 4 x 9 watt UV Lamp. Optional: If additional coverage of Gelavish is desired (for deeper colour), apply a second coat and repeat curing instructions in step 4. Step 5) Apply a thin and last layer of Dual-it, (Base & Top Gel) from the cuticle to the free edge, sealing the Gelavish nail. Cure for 40 seconds in a Gelavish “cure” LED Lamp or 1 minute in any 4 x 9 watt UV Lamp. Step 6) Using Wipe-it Gel Cleanser & Gel Wipes, remove the tacky layer from each nail. Using File-it, file the free edge and side walls of the nail to preferred finish if needed or desired. Apply a thin layer of Enhance-it making sure to seal the tip and edges. Cure in UV for 1-2 minutes or 30-40 seconds in LED (depending on the strength of the lamp). Enhance-it may be applied at any time during original application or days after. If applied long after original application, make sure the surface is free from dust and residue. Enhance-it is a gel polish colour so we recommend a layer of Dual-it be applied to seal your effect and extend the life of the Enhance-it. Make sure to clean, sanitize and etch the nail surface prior to application. 1) Apply Prep-it to surface of the nail allowing it to dry. 2) Apply a thin layer of Dual-it making sure to seal the tip and edges. Cure in UV for 1 minute or 30 seconds in LED. 4) Optional : Apply a second coat of Gelavish for a deeper shade and repeat curing. 5) Apply a thin and last layer of Dual-it making sure to seal the tip and edges. Cure in UV for 2 minutes or 40 seconds in LED. 6) Using Wipe-it and Gel Wipes, wipe the surface of the nail removing the tacky layer. • Gelavish cannot be flash cured or frozen in light. It needs at least 20 seconds of cure time to prevent extreme shrinkage.